Hydraulic Hoses are very different from LPG hoses and their maintenance require extra efforts. Safety is the utmost concern with regards to the maintenance of hydraulic hoses. A damaged hydraulic hose poses serious threat to the people and the nearby surroundings. Besides the risk factors, a poorly managed hydraulic hoses requires replacement earlier than their deadline and also impacts the overall productivity. One of the best way to maintain your hydraulic hose is to keep checking them every month. By doing that, you would be able to catch up with issues with the hydraulic hose assemblies which might create serious problems in the future. Though, it takes time getting used to a routine check up but it will save your equipment from expensive and lengthy downtime. It will also extend the life of your hydraulic equipment. A leakage can only add to the problems. First of all, leakage means wastage of hydraulic oil which is very expensive. Apart from that, leakage attracts a penalty imposed by ISI and yes, don’t forget the cleaning cost. It can risk the lives of technician or machine operator as they might slip and fall due to the leakage. It also poses a possible fire risk which is higher when machine operates in an area where ignitive substances such as die casting and plastics forming. For effective hydraulic hose maintenance, you should learn to identify the potential hazards. Check for twisting or the tight bends, abrasions in the cover and visible cracks. It is important that the hydraulic hose is properly covered as it protects the fabrics or the wires from environmental or weather hazards such as rocks. Id the fabric and the wire is not covered, water and debris can ruin the wire by rusting. Water also damages the fabric by wicking into its system. While you replace the hose assembly, make sure it’s been properly cleaned before it goes into the hydraulic equipment. If the fluid is carrying debris to your hydraulic hose, it can harm the inner tube. It will ultimately lead to another failed hose assembly. Overheating or the excessive heating of the hydraulic hose assembly leads to the hose failure. The inner tube will get hardened and start cracking. It happens because the plasticizer in the elastomer breaks down or gets hard under high temperatures. To avoid overheating of the hydraulic hoses, make sure they are rated for the temperature required for the application. Apart from that, you can protect the hydraulic hoses from excessive heating by reducing the ambient temperature and using shields or heat guards in high temperature areas or excessively heated surroundings. The temperature for the hydraulic fluid should be within the recommended temperature for the hose. There is a reason why temperature ratings are there and differ from hose to hose. Check the temperature rating for your hose by referring to the product catalogue or by looking on the hose layline. If the temperature exceeds the specified limit, small cracks will appear on the inner tube leading to the inflexibility of the hose. The pressure ratings should never exceed the specified limits. Hydraulic hoses are tested at higher temperatures but it still it’s for our own safety to use it within the specified pressure limits. You can find the pressure rating in the user manual or the product catalogue provided by the hydraulic hose manufacturers. If you use hydraulic hoses at higher pressure, it will curtails the lifespan of the hoses and also impose serious and hazardous threats. Do the testing if the hose fails. If you do the testing, you will understand the cause of failure and how to fix it. Such failures can be prevented afterwards. 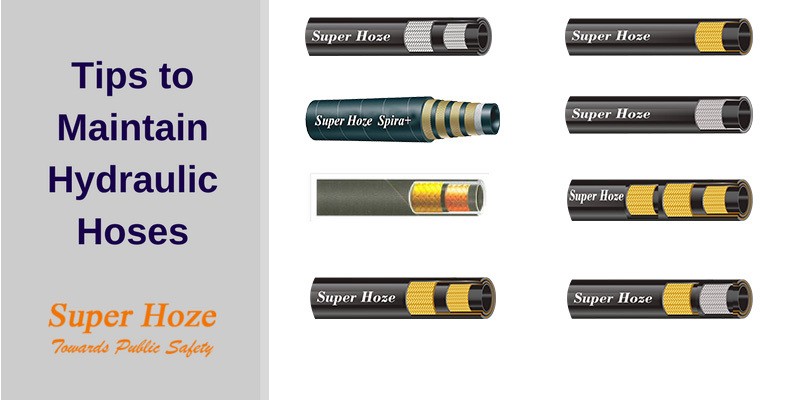 For a detailed information about how to perform a hose failure analysis, you can get in touch with the hydraulic hose manufacturer. Aforementioned tips will ensure that your hydraulic hoses remain well maintained and can be utilized for a longer period of time.